The Faith Neptune Baby Jumbo Acoustic, Hi Gloss Natural provides the player with a sonically-powerful acoustic voice, a stunning combination of tonewoods and a comfortable playing experience with a lavish appearance. With a solid engelmann spruce and solid rosewood construction, the Faith Neptune Baby Jumbo projects a classic sonic performance with plenty of versatility, power, deep lows, articulation, and clarity, ideal for numerous genres and techniques. 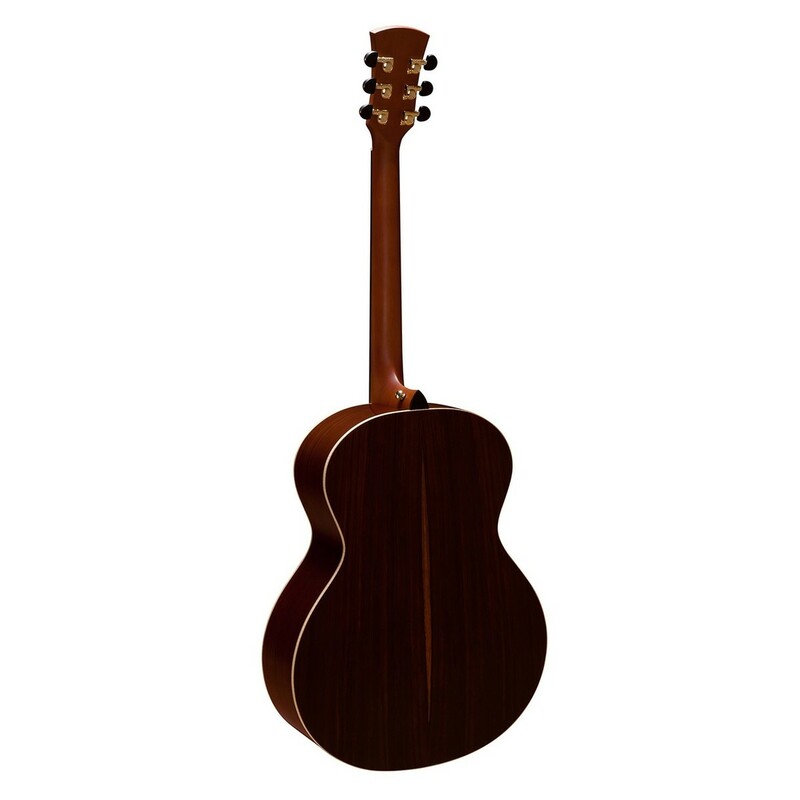 Furthermore, the Neptune Acoustic Guitar features a scaled down jumbo body also known as the 'baby jumbo' with a 16'' lower bout, providing the player with the sonic-power of a traditional sized jumbo but with comfortable, easy playability. This dynamic and responsive instrument also features legendary Patrick James Eggle bracing for a richer acoustic performance and a bolt-on neck design for added durability. Lastly, with abalone inlays, gold hardware and Faith's iconic MOP 'F' inlay, the Neptune Baby Jumbo offers an impressive look to match its tone. The Faith Neptune features an entire solid wood construction for a superior tone and incredible dynamic response. Its solid engelmann spruce top yields crisp articulation and slightly richer mid-range than sitka spruce. The solid top's smooth tone provides a versatile soundboard that is able to accommodate numerous genres and techniques with equal ease, from fingerpicking styles to heavier strumming patterns. Furthermore, the solid engelmann spruce top is paired with solid rosewood back and sides that produce a strong, warm, deep bass response. Its solid rosewood back and sides also produces an incredibly rich tonality with a throaty growl while its treble notes sparkle with plenty of crystal clear clarity. Lastly, with rosewood's iconic tone and spruce's versatile nature the Faith Neptune is ideal for bluegrass, folk, country licks, as well as accommodating meaty chords and a variety of picking techniques. With a neck constructed from mahogany, the Neptune Baby Jumbo offers a quick and dynamic response with plenty of warmth and resonance. Mahogany's nature allows it to respond superbly to numerous playing styles and techniques with ease, perfect for getting creative and unleashing true potential. Furthermore, the neck is topped with a Macassan figured ebony fingerboard that adds ringing sustain, plenty of bite and a bright sizzle to the guitar's overall tone. For added aesthetic appeal, the fingerboard also features Faith's majestic 'F' logo placed on the 12th fret and inlaid in mother of pearl for an elegant look. The Faith Neptune Baby Jumbo features a scaled down jumbo body, providing the player with the same powerful voice that a full-sized and more traditional jumbo can project, but within a more comfortable size. Its size is also ideal for those that find full-sized jumbos a little to much to handle as the baby jumbo is easy to hold close to the body and offers comfort throughout both seated and standing performance. Removing the bulky body and replacing it with a slimmer, more compact size and a 16'' lower bout also provides comfort, and sonically produces plenty of balance, definition and superb acoustic volume. Furthermore, with its sonically-powerful body, combination of solid timbers, and legendary Patrick James Eggle bracing, the Faith Neptune delivers a harmonically-rich tonality that is expected on higher-end instruments. The Patrick James Eggle X-brace design and is made from quarter-sawn spruce, offering reinforced structure with enhanced tone and volume. Bracing serves two purposes, to stop the guitar from collapsing under string tension, and to shape the guitar's sound. 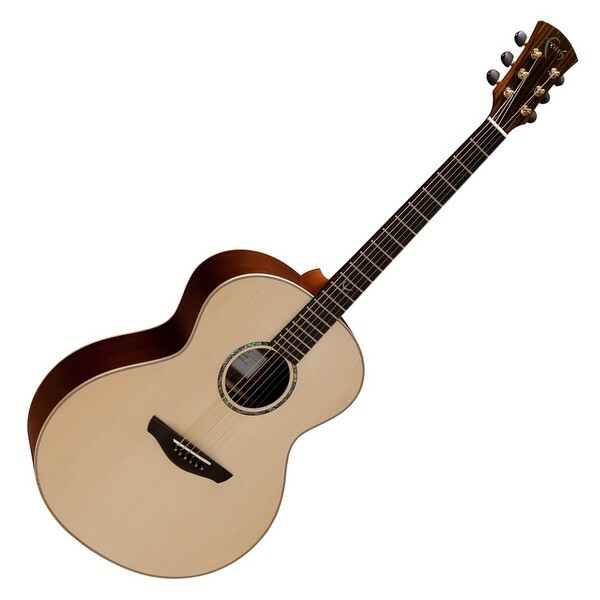 The Patrick James Eggle X-brace design forms an X shape that intersects just behind the sound hole, giving support and stability to the guitar with a rich, beautifully balanced tone and superb projection. Patrick James Eggle had a major input to the design of many of the Faith family and built his first guitar at the age of fifteen as a school project. By the time he had completed it, he was already completely dissatisfied by the outcome of his project, and decided to pull it apart and start again from scratch. This started a life long obsession which lead him to fame and has now gained an incredible reputation among collectors and players for his uncompromising quality and amazing eye for a tasteful design. His commitment to producing guitars of the highest quality tone, finish, and playability is extremely popular. Faith was created in 2002 by an exclusive group of veteran guitar specialists, led by the legend himself Patrick James Eggle. He has trained each new staff member in hand-building and hand-finishing techniques that have characterised Patrick James Eggle guitars for decades. With workshops located in West Java, Indonesia, Faith have dedicated their working lives to both sustainable and ethical manufacturing processes, and are extremely conscious of environmental and human resource concerns. Each Faith model is produced in accordance with this vision and radiates the elegance of craftsmanship and superior tonal sounds for which Patrick James Eggle's designs are so well known.